This paper proposes a remote conversation support system for people with aphasia. The aim of our system is to improve the quality of lives (QoL) of people suffering cognitive disabilities. In this framework, a topic list is used as a conversation assistant in addition to the video phone. The important feature is sharing the focus of attention on the topic list between a patient and the communication partner over the network to facilitate distant communication. The results of two preliminary experiments indicate the potential of the system. 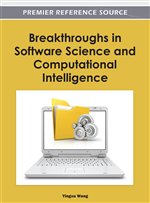 Recently, the concept of cognitive informatics is attracting attention as a new discipline of new generation computing paradigm (Wang & Kinsner, 2006; Wang, 2006, 2007). It studies the natural intelligence and internal information processing mechanisms of the brain, as well as processes involved in perception and cognition. It is natural to extend the concept of the cognitive intelligence from the individual natural intelligence to the plural intelligence of group or community. Symbiotic computing is one of the important applications of the extended cognitive informatics. It is developed to achieve an information processing environment as an interaction between humans and computers as well as fundamental issues in human perception and cognition. Sugawara et al. (2008) mentioned that it is a methodology that can be realized by integrating three functions such as Ubiquitous/Network functions, the Web Functions and the Symbiotic Functions. Symbiotic computing is formal to bridge an e-Gap between Real Space (RS) and Digital Space (DS) as bringing the social heuristics and cognitive functions into DS (Sugawara et al., 2007). Based on the “basic principle of symbiosis”, human society and digital space mutually interacts each other and various communication systems become widespread to help people’s daily lives. Socialware is one of the core technologies of symbiotic computing together with perceptualware and networkware. It is introduced (Hattori et al., 1999) to assist in various social activities as well as to resolve limitations on network communities. Hattori et al. (2007) have proposed a framework of socialware especially to support people with cognitive disabilities. One of the typical cognitive disabilities is aphasia. Aphasic people have difficulty in communication results from damage to the language centers of the brain. Aphasia is not only a speech disorder anymore, but also a handicap that hinders people from participating in social interaction . Family members and caretakers are required to simplify language by using short, uncomplicated sentences, repeating key words or writing meaning of the words as needed while communicating with them. In order to assist people with aphasia, a vocabulary data file is proposed to improve the quality of lives (QoL) of people suffering cognitive disabilities (Yasuda et al., 2007). Quality of life of aphasic people may be understood in terms of their participation of social affairs, emotional health, and psychological well-being (Cruice et al., 2003). The patients would like to make daily conversation with their family members, relatives or friends beyond their basic needs and wants. Enjoying conversation itself would be a basic requirements or necessary condition of anyone’s happiness to maintain their QoL. In this system, called “Rakuraku Jiyu Kaiwa (Easy, Natural Conversation)”, the topic list taken from the vocabulary file is shown on a PC monitor. By pointing at the word on a PC monitor, aphasic patients enjoy daily communication with their partners. This system is, in a sense, intended to be used for helping face to face conversation. That is, a person with aphasia and a therapist (conversation partner) talk each other in front of a PC monitor that displays the word list. In that situation, both users are required to be at the same place to conduct a conversation. This is the limitation when the patient wants to talk with other people who are not near to his/her place. From the viewpoint of increasing his/her quality of life, it is desirable for a patient to have as many opportunities as possible for a conversation. In order to achieve this objective, we have extended the concept of “Rakuraku Jiyu Kaiwa” to facilitate remote (distance) conversation over the network.